Art, to me, is something which touches my senses, which provokes an emotion and which stays in my mind for a while. And what is a cup of coffee? Well, it touches my senses, it provokes an emotion and I usually don’t forget about the good coffees I drink. 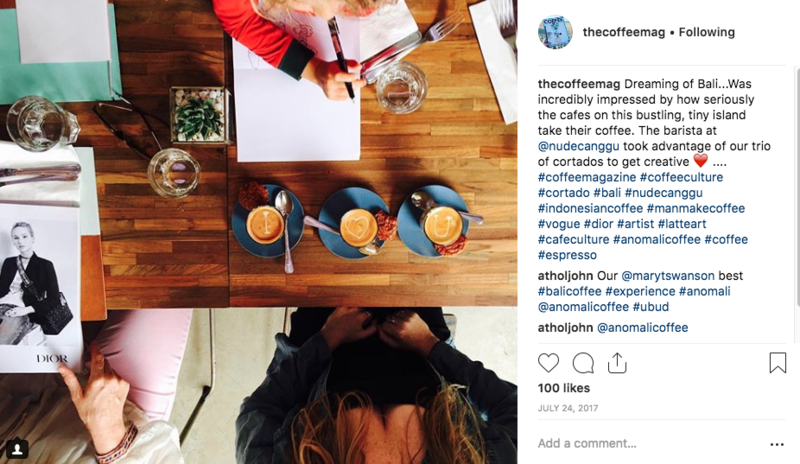 When I got asked to write an article about the very special connection between coffee and art, I first thought about my background as an art historian and second of my background as barista. Several paintings came to my mind where coffee has been the subject for artists. I have chosen a few of my favourites to share with you, the ones that had the most impact on me. The first one who came to my mind is Venezian, which is fitting as the history of coffee has strong Italian connections. 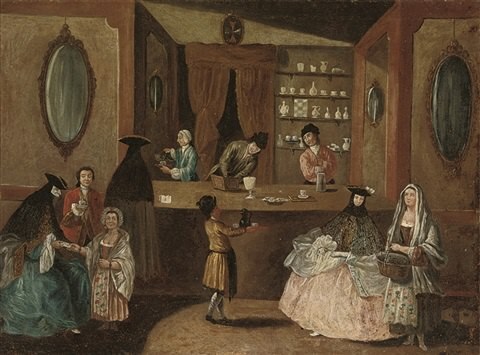 An artist called Pietro Longhi painted several paintings about the coffee culture in cafes in Venice. This shows the awareness of coffee in the Rococo Venice era. It gives us proof of the early culture of coffee shops in the 18th century. 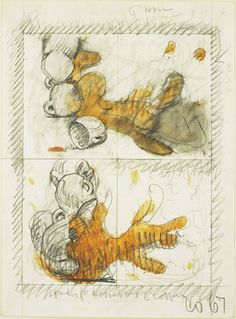 As my mind rambled through a gallery of paintings I have seen in my life, one of my favourite artists and surely one of the greatest artists of the last century popped into my thoughts: Pablo Picasso. 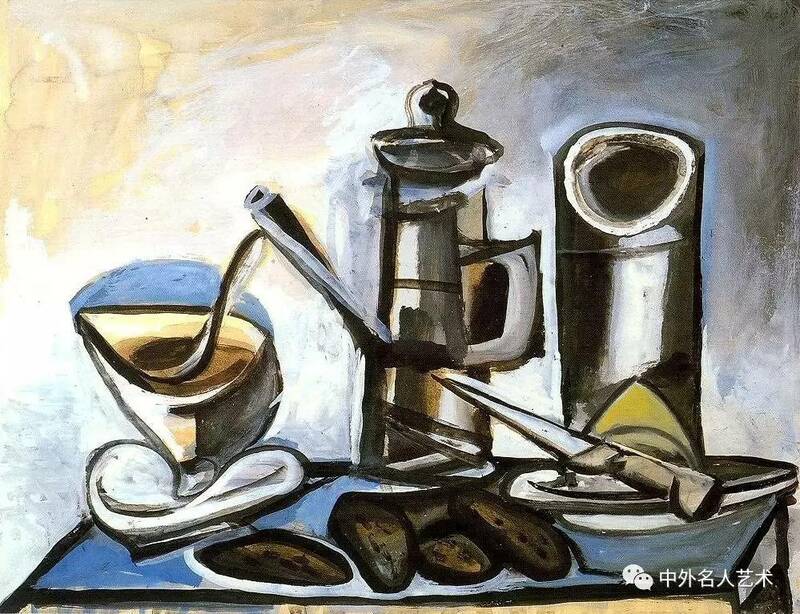 In the 1940s, he began a series of paintings with the title “The coffee maker“. In this particular one in the series, you can see a kettle and a filter coffee device. Both the coffee and his artworks have lost none of their cultural relevance. These items could be found in your or my kitchen today. But why did he paint that? Without having known him as a person- what a pity!- I allow myself to posture that I think it is simply because he liked the beverage so much and the ritual so much that he wanted to paint it. It came into his focus and attention and was worth to him to take time to paint. This relevance is where art begins in my opinion. “Nighthawks” by Edward Hopper (1941), is considered as one of the greatest masterpieces in US art history, painted just after the attack on Pearl Harbour, which marked the entry of the USA into World War II. It shows a nocturnal situation in a typical American diner and is filled with pessimism and hopeless gloom in the wake of such an event that caused so many families pain. You can see the two espresso machines in the back of the painting. The coffee is not the focus of the piece, but it does illustrate how people gather in cafes in the best of times and the worst of times. Still in the US, coffee infiltrated popular culture. 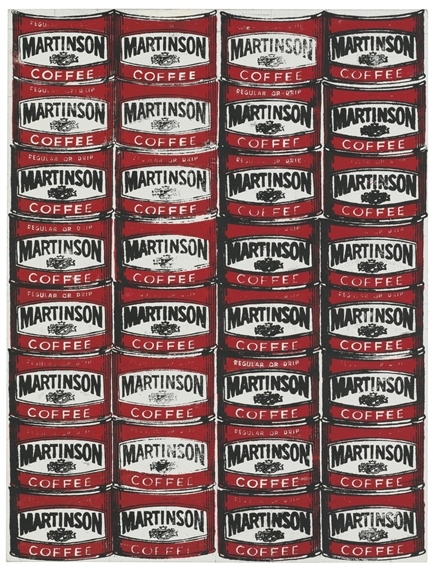 Everyone might know Andy Warhol’s silk screen produced masterpieces of Marilyn Monroe or the Campbell Soup cans, but not so many know the masterpiece also produced in the 1960’s, “Martinson Coffee Series”, which shows a high number of instant coffee tins. Coffee had become a basic, household product which was accessible to everyone, a mass-produced phenomenon celebrated by one of the most respected Pop Artists of the era. We may not qualify instant coffee as art, but certainly it’s cultural relevance inspired a great artist. Let’s move to an art discipline with huge relevance nowadays: photography. 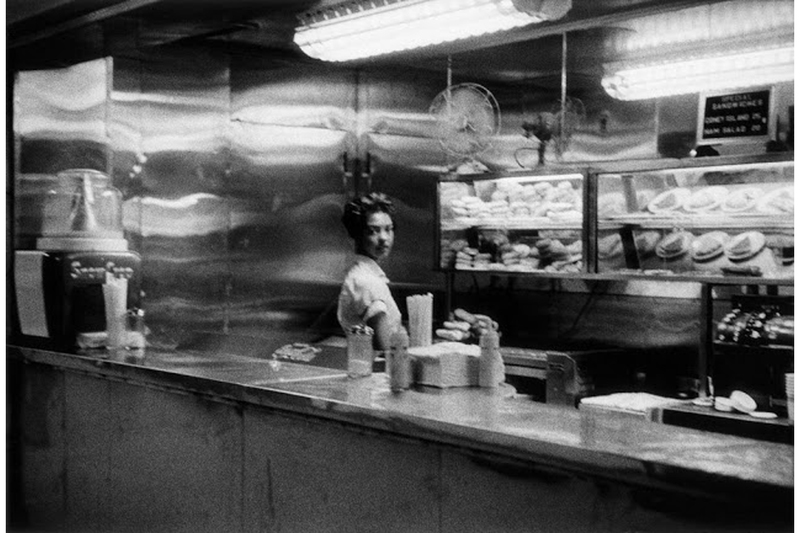 A very early piece is Robert Frank’s “Coffee Shop, Railway station, 1955-56”. Robert Frank is famous for his photo book, “The Americans” which had a big influence on the story of photo books and is also evidence of his fresh and nuanced outsider's view of American society. The composition and the subject matter positions coffee strongly at the forefront of culture. Some may argument that this photo book is the forerunner of the coffee table book industry, which is still thriving today. We can see this in the coffee industry in fact, with coffee professionals releasing such pieces of art and literature. Hard covered books with a pictorial focus and the subject matter of these coffee table books is in fact, coffee. Why did all these artists make coffee a subject of their artwork? We could say it is because they liked it, because it was part of their daily routine, because it shows the culture of place. That is how art begins; when somebody focuses on a subject and does not take it for granted, their attention gives that subject importance. Of course you will find a lot of definitions of artists, paintings or sculptures, but there is one definition of the Oxford dictionary which I really liked: “A skill at doing a specified thing, typically one acquired through practice.” Isn’t making coffee such a skill? Let’s take the often over-looked barista. A barista tries to learn a skill at doing a specified thing typically one acquired through practice. You can not become a barista without practice, just as you cannot become an artist in one day. I think all of us trying to make the perfect coffee with only one attempt have realized that making coffee is more than that. You can call it a craft. You also never stop learning when you work with coffee; there are always new techniques, new machines and new coffees that arrive that question our skills every time. So there are definite similarities there. Next, what is the piece of work that is produced by a barista? Isn’t it also an “artwork”? Some may say it is only a beverage nothing else, but some might agree with me that it is a bit more than that. In the last years the awareness of coffee has been raised, coffee shops have opened all over the world (I love it!) and we allow ourselves to pay a big amount of money when we go to our local coffee shop - money our grandparents would never have paid for a cup of coffee. It seems that the kind of coffee we are drinking has become more important to us. It has become more a lifestyle choice of where and how we drink our coffee. I think we can all agree with this. The moment of this enjoyment means a lot to us, that is why we go to a coffee shop in the morning or invest in home coffee brewing tools instead of just boiling water and using an instant coffee to be awake. I have had the privilege of tasting a coffee valued at $500/Kg (crazy I know!). 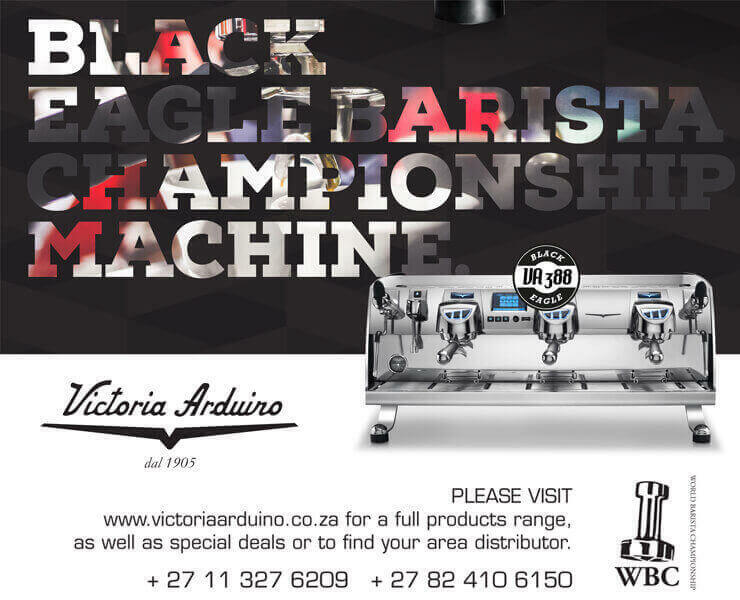 These are specialty coffees which have been treated with a lot of care. I must say that this coffee was delicious, I certainly cannot afford it every day, but I will always have it in my memories. It was a piece of art for my palate. People take the same care with food. Creative restaurants are popping up all the time and we love them, because they touch our senses, they inspire us, they surprise us and sometimes they also entertain us. In my opinion a cup of coffee is something incredibly beautiful. A good cup of coffee can make us smile, can provide a great deal of comfort. And let’s be honest, while latte art does not change the way our drink will taste, it can change our perception of the drink. We love it, our eyes love it. A heart in a cup served by a passionate barista, can still make me smile even if I have poured a million hearts myself and judged a lot of them. Latte art has been used the world over to market all variations of espresso machines and cafes, because people connect it in their brain with good coffee. Aesthetics are important to our experience of coffee. I am a big fan of beautifully designed coffee shops, because to me they are like a piece of art not only regarding interior design- very often extremely creative and made with love and little money. Sounds like young artists, no? And then there is a contentious, but not less relevant aspect of art nowadays. Social Media. We call the people who have a big group of digital followers, influencers or Social media artists. Social media tries (sometimes insincerely) to capture the beauty of a moment and this has transformed the cup of coffee- which in reality has just a few minutes existence in our on-going lives, but which is given another life by being shared to people all over the world. I don’t want to start a discussion about the relevance of social media at this point, but I think we can agree that Social media has a huge influence nowadays. Did you know that coffee and avocado were the most Instagrammed food and beverage in 2016? Artfully curated cups of coffee are taking over the digital world. So let’s come back to the question: is coffee art? I would conclude that coffee is more than just a beverage, it may not be a piece of art which remains for 200 years, but it is a small piece of art in our day, it makes us pause, look up, appreciate the beauty in our cup and our surroundings. I think we can agree that usually the more knowledge, passion, quality and skills you put in a cup of coffee, the better it gets. And then it starts becoming a piece of art to me. And much like art, sometimes you may not understand all the parts to it, but you can appreciate all the work that has gone into it. Enjoy your next cup of coffee!